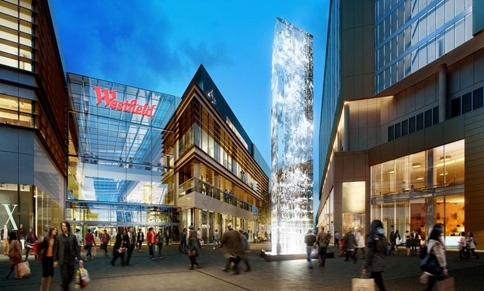 Jason Bruges Studio has designed the world’s first digital water feature for the Westfield shopping centre in Stratford, east London. The feature will launch when the centre opens in September. Bruges was briefed by Westfield to create a design that will be ‘both engaging and sensorial’. The brief was shaped by Westfield’s collaboration with the Discover children’s charity, which took children around London and asked them what they wanted to see in public art. They expressed an interest in an interactive piece using water. Bruges’ Digital Fountain uses light to represent water, with Perspex tubes within the fountain reflecting light, making it appear to be falling as though on a waterfall. The piece is designed to ‘provide a synergy between sections’ of Westfield, and aims to have a presence both during the day and at night. 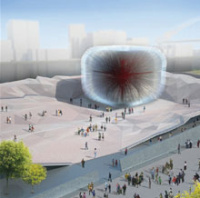 Other sculptural structures at Westfield will include a piece by artist Tatiana Echeverri Fernandez, who won Westfield’s Studio East competition.